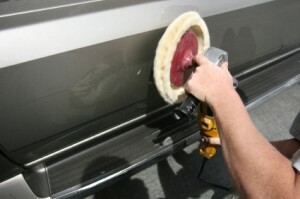 Huber has a variety of inert minerals for use in cleaners, polishes and buffing compounds from 1 micron to coarser products. Our ATH, calcium carbonate and barium sulfate products have a low silica content, making them ideal for use as mild scrubbers. Contact Us today for more information and to obtain product samples. In need of a high performing white mineral TiO2 spacer solution? We’ve got it for you! Huberbrite® 1 is an ultrafine ground white barium sulfate. 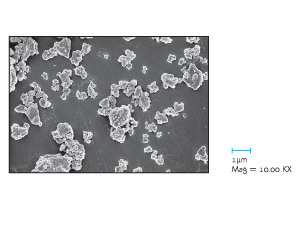 Its fine particle size, morphology, white color and particle size distribution make it well-suited for TiO2 extension for interior or exterior applications where scrub or acid resistance is a requirement (see electron micrograph at right). Huber Engineered Materials has a high-peforming TiO2 spacer for you to consider: Optifil® JSU calcium carbonate. Optifil JSU is an ultrafine ground calcium carbonate product grade produced from a specialty ore deposit. 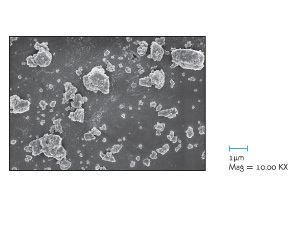 It has a median particle size of 1.0 and its soft ore body results in a more rounded shape (see the electron micrograph at right), which promotes dispersion and less crowding. The milling process also results in roughly 40% of the particles by weight being less than 1 micron, an ideal size for spacing TiO2. It is for use in interior applications. Order your sample today!